Description: Eastbound heading into Clovis, NM, on the BNSF Clovis Sub. Shot taken at the west boundry line of Cannon AFB. Description: BNSF H1 logo on BNSF 995. 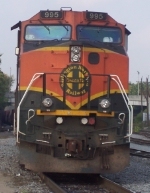 Description: H1 logo on BNSF 995. Description: BNSF 995 awaiting assignment at Delta Yard. Description: BNSF Eagle Pass, TX to Tulsa, OK manifest train H-EAPTUL1-15A passes the north leg of the wye to the KCS at Metro Junction on the BNSF Fort Worth Subdivision - BNSF 5094, BNSF 4063, BNSF 995, BNSF 4178, 30 loads, 64 empties, 5968 tons, 5345 feet, ETD BNQ 42813.